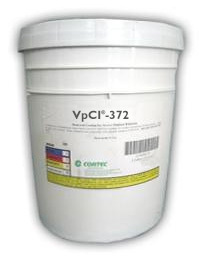 VpCI-372 is a water-base corrosion inhibiting strippable coating. It provides protection in two ways: atmospheric corrosion and as a physical barrier to protect against nicks, abrasion, scratches, etc. VpCI-372 is used as a dry film, temporary coating for parts and equipment. The coating is stripped or peeled away prior to equipment use, and will not leave a residue. VpCI-372 can be applied to some plastics; however, each plastic needs to be checked for film removal with time. Dry thoroughly before peeling film. Minimum film build is 2 mils DFT (50 microns) for indoor applications and 8 mils DFT (200 microns) for outdoor applications. Do not expose cured film to extreme cold temperatures (lower than 10°F / -12°C). VpCI-372 is supplied as a water-based, milky white liquid. It is applied by spray, brush, roll, or dip. It provides a clear film which allows for inspection of the surface. If desired, it may be tinted for easy identification of protected surfaces. The film can be peeled from the surface when it is thoroughly dried leaving a clean, ready-to-use substrate. Available in 5 gallon plastic pails (Cortec Product # 12300326) or 55 gallon metal drums (Cortec Product # 12300327). 5 gallon drum weighs 50 pounds and ships under our standard shipping rates. The 55 gallon drum must be shipped by truck. We will provide you with a freight quote before we ship this product. VpCI-372 should be stored in a heated warehouse to avoid freezing. The shelf life of VpCI-372 is up to 12 months.